Sherwood High School’s illustrious history had its origins in the 1920’s. At that time, Sherwood had a number of independent one-room-schoolhouse options for students, but there was no dedicated high school. Sherwood students in grades 9-12 traveled to Tigard or Newberg to attend school. As the city grew, citizens saw the need for a high school, but had no funds to build one. In 1934, federal Works Project Administration (WPA) money became available and the high school project was underway. By January of 1936, the school was mostly built and was officially registered as Sherwood Union High School District 88J. Unfortunately the WPA money ran out before the school was completed. Undaunted, Sherwood parents and townspeople gathered donations, formed work parties, and joined together to finish the school. Sherwood High School’s first graduating class was the Class of 1937. In 1971, Sherwood High School moved to its current location on Meinecke St., and has since undergone several remodeling and renovation projects. 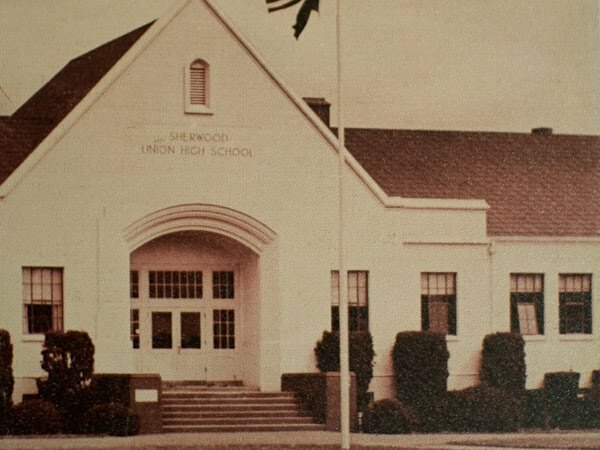 The original union high school building still stands and is currently home to Sherwood Middle School. When Sherwood High School first opened its doors in 1936, it was the Home of the Bulldogs (not the Bowmen!) and the yearbook was known as The Palladium. The shift to The Bowmen (the mascot), The Quiver (the yearbook) and The Arrow (the school newspaper) is tied to town history. In the 1940’s just after WWII, a group of men, mainly WWII veterans and Kiwanis Club members, formed a group known as Robin Hood and His Merry Men. The Merry Men were a social group that met for elk hunting and other activities and ‘high jinx’, but the group also had a civic side. They often traveled to nearby towns to march in parades, promote Sherwood, attract business, and draw attention to the historic Old Town center. 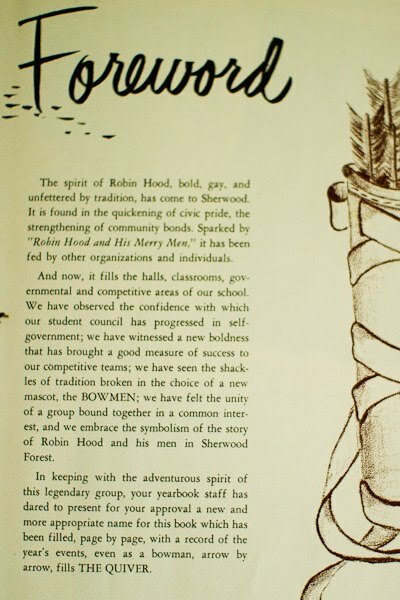 In 1953, the Merry Men started meeting as the Robin Hood Festival Committee. In 1954, they worked with the Sherwood Chamber of Commerce to form the Robin Hood Festival Association, and in July of that year, held the first official Robin Hood Festival. Due to the Merry Men’s efforts to align Sherwood with the Robin Hood legend, the Sherwood High School administration and School Board decided to make the change as well. It was in the 1953-1954 school year that Sherwood High School became known as the Home of the Bowmen. 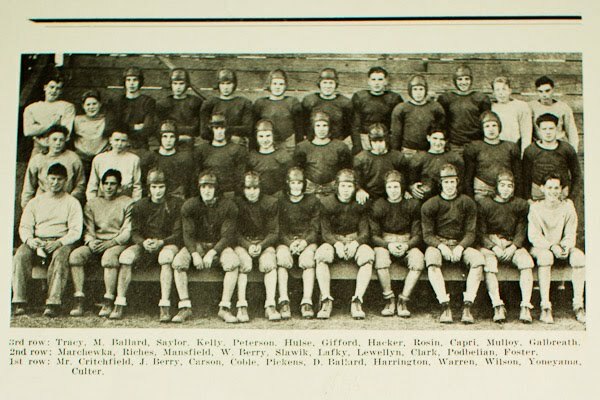 Sherwood High School fielded its first football team in 1936 and played their first game ‘in a field at the base of Washington Hill’ (the hill rising out of Old Town along Washington Street). Through the years, the team has played with heart, determination and pride. 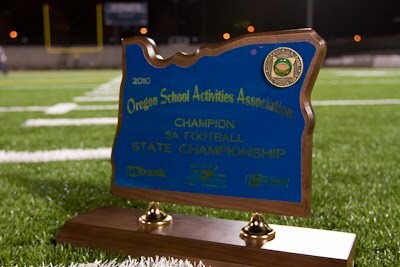 The team has had its share of both winning and losing seasons, but in 2010 on the team’s 75th anniversary, the Bowmen won their first State Championship title. Click here for season summaries going back the first 1936 season. ~ Many thanks to June Reynolds, Odge Gribble and The Sherwood Historical Society.